The Residing World Pedi-Perch is a necessary addition to your fowl’s domestic. 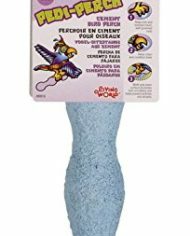 It is a cement fowl perch that helps trim and hold blunt, well-groomed nails. The multi-grip wave floor promotes foot circulation and helps steer clear of arthritis and atrophy. In addition, the Pedi-Perch helps clear and situation the fowl’s beak.